Those who apply too much force when brushing or use a toothbrush with hard bristles are truly setting themselves up for failure. Not only is brushing with great force or with anything other than a soft-bristled toothbrush unnecessary, but doing so wears down the glossy outer layer of your enamel. Remember, when enamel is worn away, whether it’s from drinking soda over several years or brushing too hard, it’s gone forever. Furthermore, you aren’t only damaging your teeth by overbrushing. As a result of your enamel wearing away, your gums begin to recede over time. This will eventually begin to expose the tooth roots, which are far more susceptible to decay and infection. 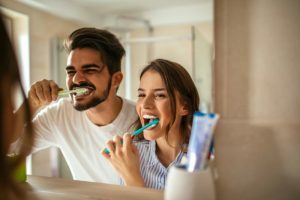 The bottom line is if you want to prevent enamel erosion and premature gum recession, you’ll need to confirm if you’re current oral care habits are more harmful than helpful for your oral health. One of the most common signs of overbrushing is tooth sensitivity. It doesn’t matter whether you feel it while brushing or not, but feeling it at all is a sign that something is not right. You’ll also want to take a closer look at your current enamel and see if it appears yellow. Even if you brush twice a day and use a whitening toothpaste, the enamel will begin to wear down and start showing the naturally yellow dentin layer underneath if you overbrush. Finally, take a look at your current toothbrush. If you’ve had it for less than three months, it should still look relatively like how it did when you popped it out of the box. However, if your brush is looking flattened and frayed after less than three months of use, it means you’re overbrushing. To get an idea of how much pressure you should apply, hold your toothbrush with only your thumb and first two fingers. Purchase an electric toothbrush. The vibrating/rotating head will do a majority of the work for you. Set a timer for two minutes to prevent rushing. Focus on being as thorough as possible, rather than being fast. Are you experiencing tooth sensitivity or gum recessions due to overbrushing? Schedule an appointment with a dentist today to get treated and advice on improving your at-home care! Dr. Daniel Weldon earned his DMD degree from the University of Florida College of Dentistry. Every year he works hard to continue his education to stay on the cutting edge of dentistry’s evolving treatments, techniques and technologies. To learn more about his practice, you can contact him through his website.